Happy New Year Fringe fans! And WOW, what a way to set up the series finale! A lot of our predictions are certainly becoming part of this grand finale to this 5 season epic tale. But, even while we may have been able to predict it, they are delivering the information to us with some surprising twists. And the best part about all of it, it all makes sense. I love the fact that they are attempting to close some of the unfinished work from season 4 in these final episodes to deliver an even bigger emotional punch to our guts in the end. It's all working splendidly for me and the long and slow build up to the Observer takedown is finally starting to pay off. (We knew it would, but we thought we'd never get here) I mentioned it in my tweet last night, but if the final 2 hours are anything like this past one, we're sure in for a treat! Well, no sense in delaying, let's dive into this penultimate final recap of Fringe. Whew, so much to discuss. I'm going to try and fly through the recap portion because I think a lot of the things mentioned in the show require more discussion than recapping! So, the big reveal at the end of the last episode was that Donald is September. Based on our discussions, everyone else was correct in assuming that September BECAME Donald and not vice versa. But don't you worry, because one of my theories in that discussion came true too! Anyway, Peter is working through the night to drill through the amber while Walter is having a case of insomnia as well. He realizes that the boy unlocked a memory in Walter's subconscious and he wants to revisit it. So, obviously we need to send Walter into the sensory deprivation tank. Since this is unofficially part 1 of the series finale, it would make sense that we'd revisit the tank that first made its appearance in the pilot episode. I always love some good old fashioned mirroring! Walter dives into the memory of seeing September/Donald with hair in his apartment. 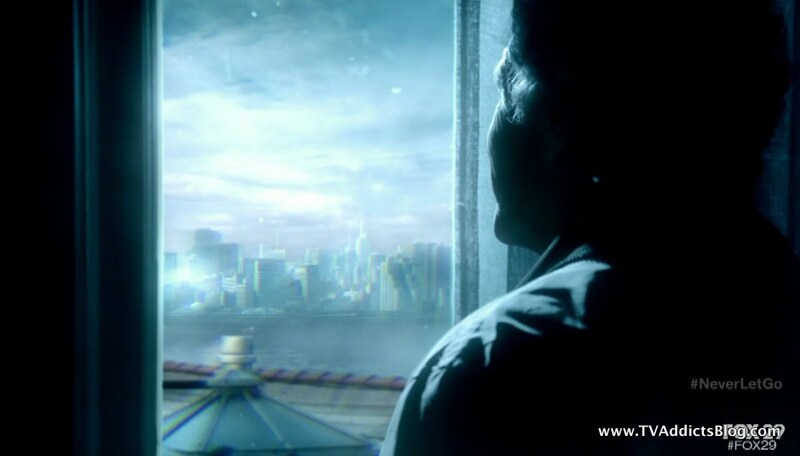 He eventually realizes, by looking out the window, that they're on the east side of New York in Brooklyn. This mobilizes the team to go find September! Quick point and then we'll revisit in the below section. 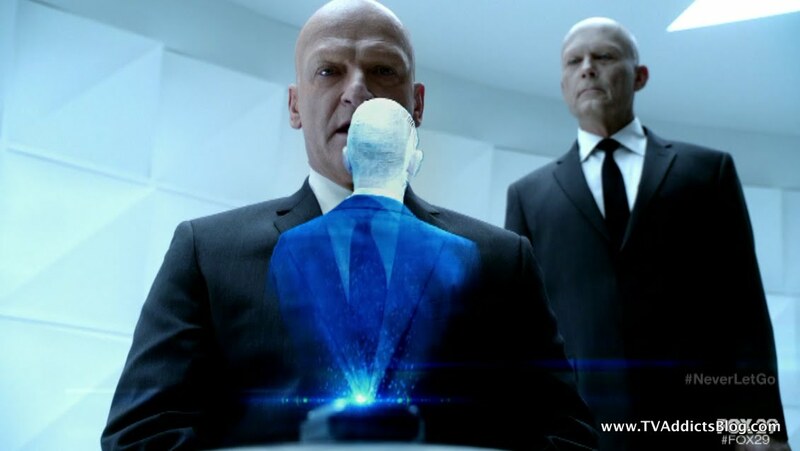 We find out that Walter's mind meld with Michael caused him to remember many things from the origina timeline. FINALLY!!! Anyway, this already led to some emotional scenes between Walter and Peter. Walter identifies the building from his memory and lo and behold, they find September! 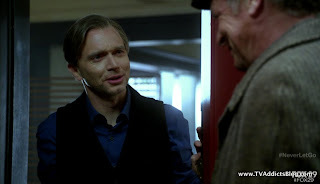 It would seem that in the season 4 finale when we saw September disappear, that was the last time we saw him as an observer. When he visited Walter at the very end of that episode and said "THEY ARE COMING" his chip had been removed and he was forced to live the rest of his days in that time period and timeline. He could travel through time no longer. It was his punishment for helping the Fringe crew over the years. He didn't really see it as a punishment though as it was his favorite time to visit. I should say that while all of this is happening, we have Windmark diving into the significance of Anomaly XB-6783746, i.e. Michael. He was summoned by his commander back to Manhattan 2609 to discuss the issues he's having. So yes, as one of our regular commenters Richard, has suggested over the weeks, we did get to see the future land! Just not with the Fringe team, yet. They discuss that they chose the timeline and time period they did because there was a 99.999% chance of succeeding. But then the find out that the boy had a 0.001% chance of surviving and he did. Quite the anomaly indeed! Okay, so for the rest of this week's story it became a cat and mouse game with Windmark as always. 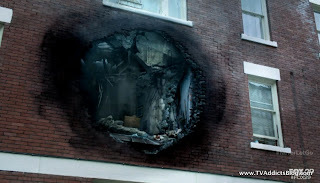 Windmark went to September's apartment, which he rigged to explode if there were invaders. Loved the tapping foot of the observer to the Jazz music! Walter and September retrieved the tech needed, while a perimeter was being set up around them. 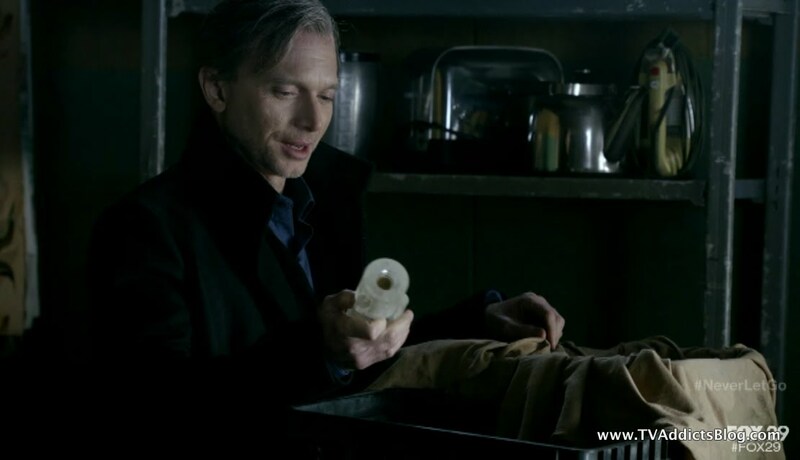 It was also revealed that Walter will have to sacrifice himself for the plan to work (yes yes, another prediction many of us have had!). Walter wondered if Michael shared with him his old memories from the original timeline to know that he had experienced love with his son. We do find out that it was Walter's decision to sacrifice himself to make up for all of the wrong he had done in the world (again, just as we suspected). Obviously, this was pretty emotional stuff and will only get more emotional next week. Maybe there's still a way to avoid it, but we'll see! Anyway Donald/September left to get a few more things for the plan. The rest of them had to split up and ditch the car to avoid getting caught. In the end, they all ended up on the monorail, but for some reason Michael left Olivia on the train and walked right into the Loyalists!! He was brought to Windmark who simply says hello which leaves us with a pretty crazy cliffhanger leading into next week!! Glyph of the Week - GRACE - Could mean anything. The producers are grateful for being able to tell this story. Donald is grateful for the life he had to live, post Observerdom. Walter is grateful for the life he got to live post hubris. I'm thinking more of what next week's final glyphs could spell out. I'm thinking something to the effect of THANK YOU. The pilot's glyph was OBSERVER which is 8 letters. So, it's quite possible that it could be Thank You. Of course, the episodes were designed as individual episodes with the final hour being the true finale, so we'll see. I've already thought way too much about this! Thanks Fringepedia for the screenshot as always! Observer Spotted - Duh, they were everywhere. We even found September! Food of the Week - Grape Licorice made an appearance. Since Walter was back to his old self, we were seeing food and all of his familiar mannerisms! Walter got naked in the deprivation tank and handed Olivia his swim trunks. They were too restrictive. Love it! After an emotional embrace with Peter he remembers Peter doesn't like public displays of affection or going #2 in a public restroom. Classic Walter! 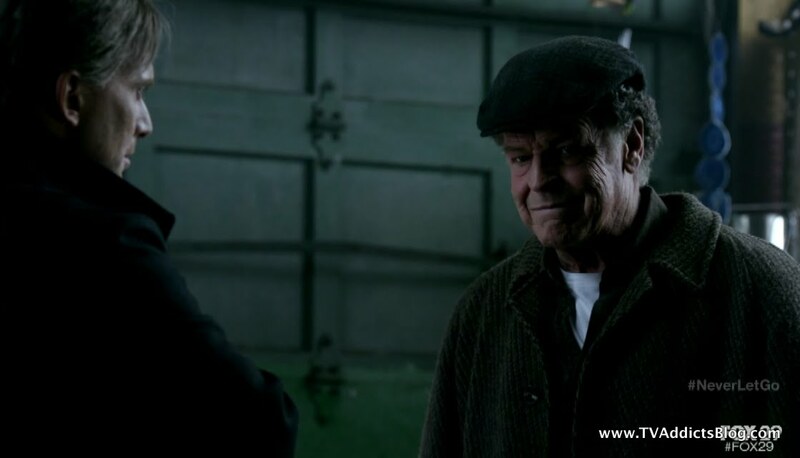 The opening minutes of the episode were with our old Walter just being happy and optimistic. Even whistling while he looked for September's apartment. Hopefully, he'll have a couple more moments next week before we have to face some serious and tragic decisions. Walter's notable change - Fringe was really trying to induce the water works this week! Walter told Peter how he was getting memories of the old timeline. The boy also fixed Walter's growing need to become his older self, so no more need of brain extraction! 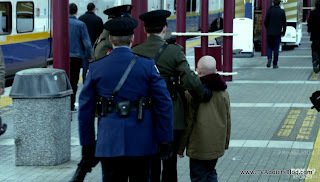 He remembered when Peter came to him in St. Claires. He thought Peter would be fatter. 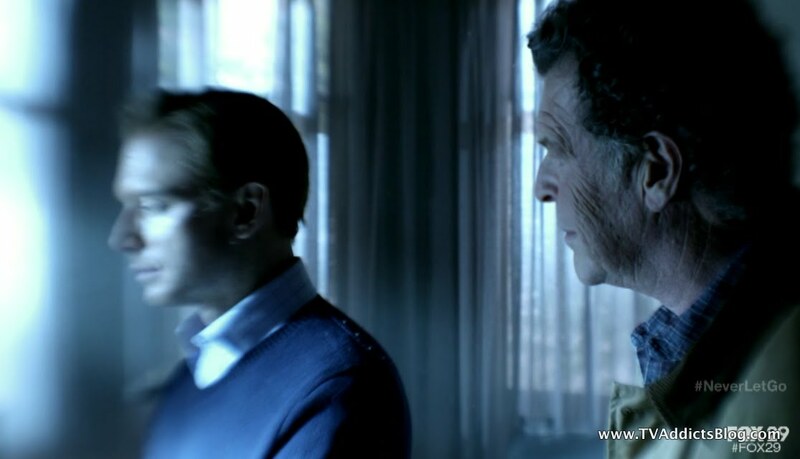 He remembered when Peter slipped (in season 2) and called Walter, Dad. That was before Peter found out he was from the other universe. Whew, what a good season! He remembered in season 3 when he felt terror of Peter going in the machine and Peter told him that this time he would have to let him go. (So he remembers the machine too, obviously!) Before Walter met Michael he didn't know it was possible to love Peter more, but now knowing what they've been through, he does. Whew...great stuff. It turns out when Walter was getting cold feet back in 2015 (or thereabouts), Donald had given Walter the "White Tulip" from that classic season 2 episode. September stole it from the original timeline thinking he may need it one day. It provided Walter with hope and was the motivation he did. So, thanks Robocop for saving the day once again! 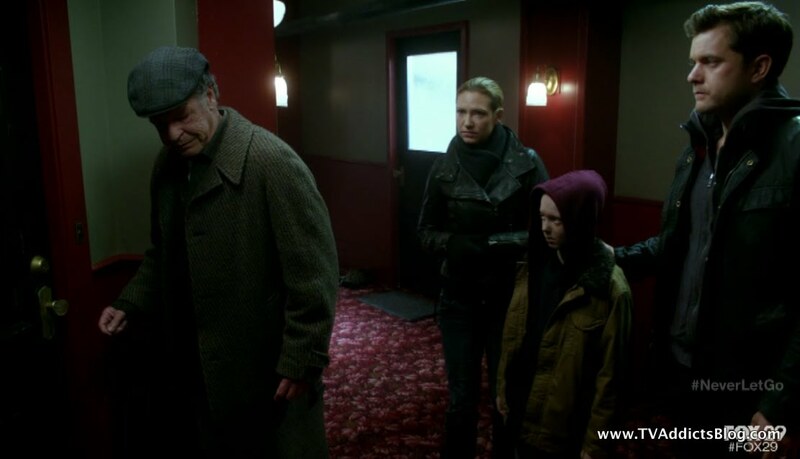 That episode is highly regarded as one of the greatest Fringe episodes. It was self-contained at the time with some mythology built in for Walter telling Peter about his origins. But, it morphed into something bigger for the Fringe fandom, and it was nice to put in the callback in these final episodes. And with the time travel implications of the episode, it fits in nicely with what's about to happen. The new reveals for September have me thinking back to some of his quotes throughout the years. Obviously, the boy is important we always thought to mean Peter. And maybe when they originally wrote it, it did (maybe not). But he was referring to Michael. There was also that season 3 scene where September confronts Peter and says something like, "It's a difficult thing, being a father." We thought it was foreshadowing to Peter's child Henry, and eventually Henrietta. But, he could have been referring to Michael there as well. Crazy stuff! Sure makes me want to rewatch this crazy show! I forgot to mention above, that Windmark is feeling a growing desire to eradicate the human race. His commander said they are harmless and should not be touched. He also says that the Fringe Team, the boy and September pose no threat and to do nothing. Obviously, Windmark is not going to listen! It would seem that Windmark is expressing some emotions of his own, wouldn't it? 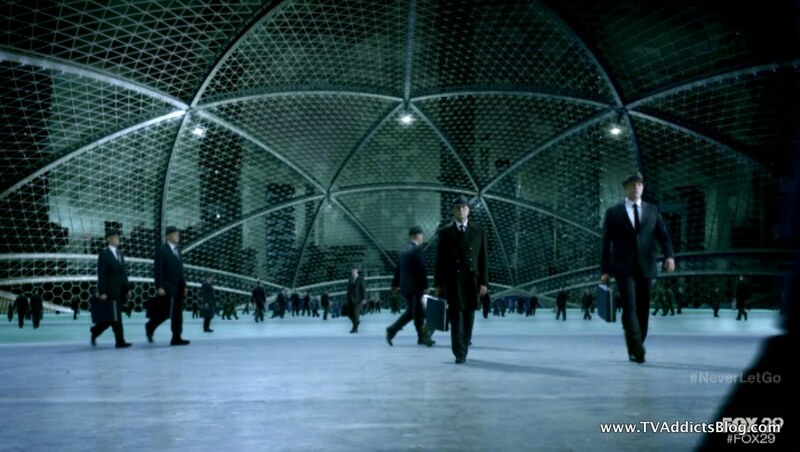 Kind of like Agent Smith going unplugged in The Matrix. I thought it was also strange that when Windmark and crew were investigating Donald/September's apartment, that it appeared like September had removed his own tech and not as some sort of punishment. Not sure of the significance of that if any. I can certainly see the show playing out with the final images being young Etta running into Peter and Olivia's arms in the park. I think some have already mentioned how some of those visions in the episode show different color blankets or what not that they were sitting on in various episodes. So, maybe one of those visions was foreshadowing to what's coming. But, what will be the other impacts to a non-observer existence? We already know Peter still made himself re-exist without the interference of September, so maybe we could assume that all Fringe events still transpired as they did up to 2015. And if Walter sacrifices himself in 2036, if time reboots, is he still alive in 2015? Lots of questions, and there probably won't be time to cover all of what would happen in a time reboot. But the important thing would be accomplished. They get their Etta back. Should be a thrill of a ride getting there too! So, any bets that the scientist in 2167 will turn out to be William Bell? May not fit the current timeline with Bell being in 2015 and ambered until 2036. But, with this show anything is possible and can be explained in a 5 second blurb! Surely, Bell will make one more appearance on this show! If not in person, then his name will be mentioned. I don't want to post any significant spoilers from the previews of next week, but I have a feeling that the Red Verse may come into play one more time too (I just won't say why I think that). I hope the producers and actors are not overhyping this finale, but it sounds like it's going to be one for the ages. Here's hoping! Okay, I think I more than did my part! Time for our discussion. I thought this was a fantastic episode and a great setup for the 2 hour final showdown with the baldies, and maybe even a larger wrap-up for the series. I think they can accomplish it all, and can't wait to see what they have in store for us. Hope you enjoyed my ramblings and I'll see you next week for one more outing! I haven't read the recap yet but OMG ! The boy is important and must live wasn't Peter ! What a great ep. I read your link with Noble - and boy was he right about the scenes with him and Peter. Did you catch Joshua's face when Peter and Walter hugged and Walter was saying about Peter not liking PDAs and going #2 in public? It was real quick but it looks like he was very emotional when they cut back to him and it got left in in editing by accident. So again the father/son issue. Even the little music box that Michael had was playing What Child is This? . Wonder why the baldies are suddenly feeling things? Windmark said he was experiencing feeling he wanted them dead so badly and the other one was tapping his foot to the music. Going to comment next. Just sharing some Fringe Books I heard about. September's Notebook - This actually made a cameo in the garage where September uncovered the future tech in this week's ep. But, it looks like the same writers that worked on the LOST Encyclopedia did this one. Tempting! 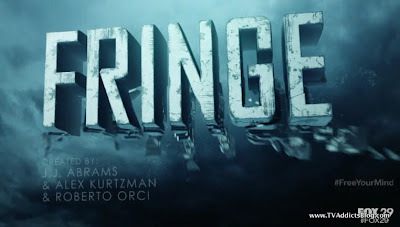 Fringe Prequel Books: There are 3 Fringe prequel books focusing on each of our main characters coming out this summer. I found a couple links below. I think the Olivia one focuses on her as a teenager and another one Peter's shady dealings before he comes in contact with Olivia and Walter and the Fringe Division. I would assume the other one is Walter based. Don't know if I'll read them or not but figured I'd share that they would be coming out! 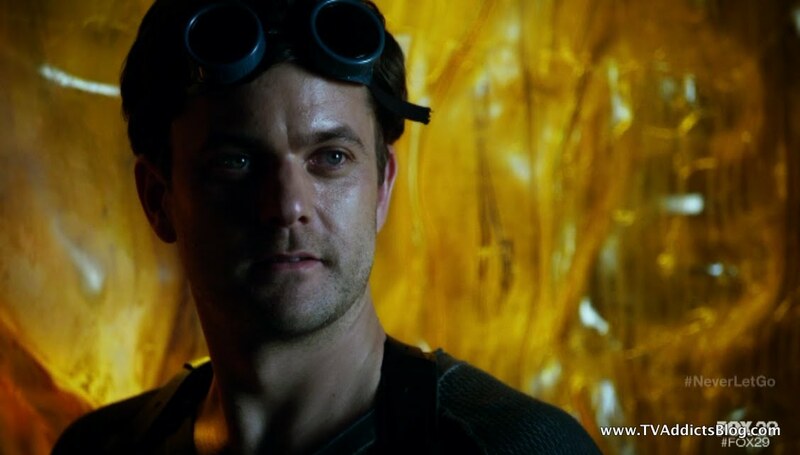 Yeah, I didn't even consider that Joshua Jackson may have gotten emotional during the scene (he probably did! )...but I just figured Peter was emotionally reacting to his "father" finally recognizing him from the original timeline. So funny, I just assumed the song playing in the music box was "greensleeves" when obviously "What Child is This" makes much more sense. 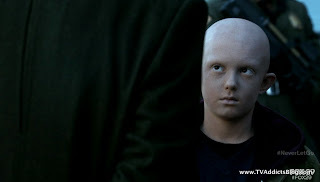 LOL Same tune, I know...but when they were about talking about the boy, it makes a lot more sense to be "What Child is This"
I noticed the baldies showing stange sorts of emotions as well. Definitely seems like foreshadowing to somnething! Enjoy the recap! One more recap to go! I have to say, I'm going to enjoy not having any more weekend responsibilities. This will be the last time that I intentionally spend a Saturday morning writing a TV recap. lol If any other show that we follow moves to Friday, it's going to have to wait! LOL But Fringe was/is Special...and I thought it deserved the attention. I like some of Jensen's ideas this week and sorta agree. With the emotions the Observers are starting to show, and Michael's intentional surrender to Windmark, it seems like something else might happen than the "time travel reboot plan" that we have speculated since the start of this season. Maybe there will be some sort of reconciliation with the observers instead of destruction. we'll see! I'm sure it will be fantastic whatever they decided! Was it me or did Joshua look really thin in this ep ? I laughed when Peter jumped whent he light went byt he window - he just looked so funny. Love that the tank was back - and naked Walter. Torv's face was hysterical. Very happy that at least Walter got to remember some of the original timeline. I was pretty unhappy that all those memories were gone for so many. I love the assumption that when they bring Michael to the future and everyone sees that he has the intelligence and emotions that it will stop them from removing the emotions to begin with. I agree with what you are saying about Septemeber getting wiped out but I think that Walter not having Sept tell him 'the boy is important' would have to change something. Until now Walter always believed it was about Peter. And what about the other Walter - he saw Sept out of the corner of his eye and got distracted, thereby not curing Peter and then causing Walter to do what he did. So if Sept never does that then Peter is healed over there and never comes over here. Whew - I have a headache ! Sigh ! I'd hoped we were wrong about Walter sacrificing himself. Interesting point about whether other assumptions we have made on what Sept says mean entirely new things then we thought. Why do you feel that Sept removed his own tech? I didn't get that at all. I felt it was removed as punishment. Donald removed the tracker though. I had actually hoped that Windmark would die in that apt explosion ! I think we all want to see Peter and Olivia in the park with young Etta and have nothing bad happen, makes me wonder if they won't do it just bucause of that. Loved the whole tulip thing - brought me back to young Olivia and Peter in the field of flowers. I won't be surprised if it is Bell in 2167 - but that will be kinda weird with the fact of his age in 2012 already. I actually watched the previews for once - couldn't help myself! But just your 'feeling' is a spoiler in itself ! Yep, that was my major issue with season 4...the fact that there was no reconciliation of memories by the end of it. I'm glad they finally paid it off with Walter at least. 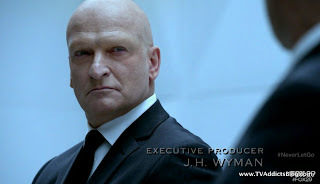 Hell, they could just have Michael touch Astrid and Broyles and we'd be complete! Definitely a big assumption...but if scientists see what their creations can lead to, they might be inspired to work towards that. I dunno! lol But, I'm leaning towards them not actually going with the plan. I think there's still a chance that Walter won't sacrifice himself. The fact that they've brought it up before it happened makes me think that even more now. Like, it all makes sense that he would have wanted to to make up for all the bad he caused. But maybe he can have one giant redemptive act that essentially cancels out the messes he caused. (tall order. lol) I agree with Jensen, something is fishy with Michael surrendering himself to Windmark. It's almost like he is the one that might be making a sacrifice or has a different plan in mind than Walter/September. The White Tulip thing...yeah made me think of that too...but clearly it was more about the "White Tulip" episode where Robocop sent himself back in time to die with his wife...then of course he mailed the white tulip drawing to Walter who got it in the mail in the future and thought it was a message from God to finally tell Peter he is from another universe. 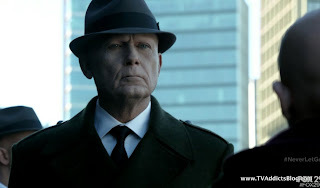 Hands down one of the best episodes of FRINGE...and I'm glad they referred to it! Thought the same - why have them say Walter has to sacrifice himself so much before hand. Totally did not remember those lights ! Great catch. LOL on the outrigger thing ! I've noticed these past weeks that when they show crowd shots the women seem like they are dressed like it's 1950 or something. Weird. The baldie growing in the tank/tube reminded me of the fetus in the apple we've been seeing all these years. And for some reason now the apple with a fetus in it is making me think of Adam and Eve. Interesting that Olivia immediately thought they'd get Etta back but Peter was not optimistic about it. Nice mirroring with the embryo in the apple....and adam/eve referencing. Never thought of it. But, with Walter/Bell wanting to create their own universe with their own rules and be God...certainly fits in. Yeah...Olivia vs. Peter and the optimism. Definitely interesting. Certainly seems too simple for things just to "reset" and everyone live happily ever after. A more Fringian ending would be for Observers to become open to human emotions and for hope for peace to emerge in the end. We'll see! Train scene was indeed intense! I usually skip the full-on recapping of the action/suspense scenes since I can't do it justice to actually watching the scene. But, yes it sure was fun to watch! Couldn't believe Michael stepped off that train. lol But now after thinking about it for awhile, it certainly poses some interesting thoughts on where the finale is going. A bit late for me in this conversation but, while I watched Fringe Friday night, the NFL playoffs took a huge chunk of my time this weekend (cough GO RAVENS cough). I decided read Doc Jensen's review too. As always lots to think about there,,, too much and too many possibilities. First I will say I loved the episode and I think we are being misled as to what the final outcome will be. This isn't a revelation by me, it's an observation that most of the times no one gets it entirely right. The writers always surprise us to some degree. I also wouldn't read into the coming attractions too much. They could purposely be misleading us. If Peter left the tech in his brain it would be permanently damaged however September seems to be a pretty well adjusted human considering he had the tech in his brain for centuries (?). Also, if the main reason they needed this ellaborate plan was because September had his tech taken away and could no longer travel through time, well the Fringe team currently has at least two of these devices. Why could they just re-insert and let September travel through time? 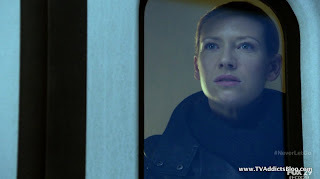 As for the Observers having all emotions wiped out, were we misled in Season 4 episode 19? Seemed those observers were pretty interested in 21st century women and night-clubbing. Hardly seems in character. BTW, did anyone else expect the person Windmark was meeting in the future was going to be William Bell? I did. As for any kind of reboot, if September doesn't exist then Walternate would never have missed finding the cure for Peter and Walter would never have had a reason for going to the other universe. Which is what started the whole chain of events. Something tells me the ending will not be perfect. There will be many paradoxes and unexplained questions left hanging. Still, I am just looking forward to how they will end it. There hasn't been a movie, book or tv series that dealt with this type of sci-fi that didn't leave the viewer/reader with a lot to think about. I for one am just glad to go along for the ride. Okay, as always, I'll probably try to be devil's advocate to your nitpicks but they're all very valid points! lol And I think we can agree that we're being misled to what the final outcome will be. It's almost like they knew what we would predict would happen (i.e. Reboot and Walter dies) so they through that out there as the plan only to throw a bigger twist our way in the end. As for the coming attractions...yes they could be misleading us, but it would be awesome if somehow the finale tied in the Red universe which was a huge part of the show for 3 seasons. 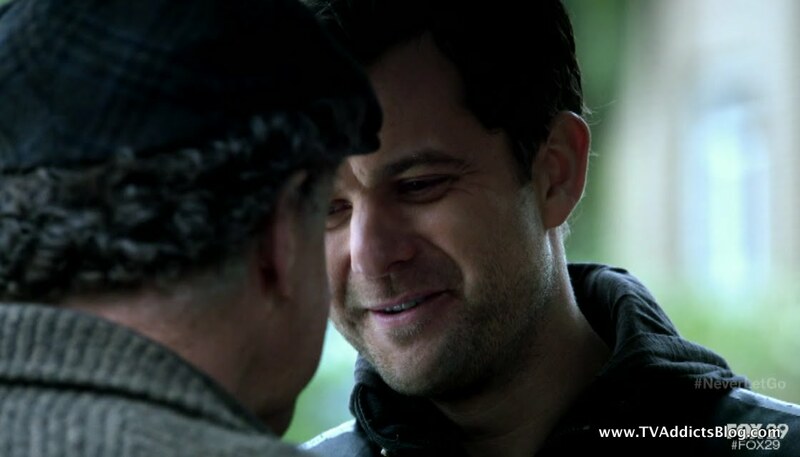 Considering Joel Wyman (showrunner) said he's wrote this episode as a thank you to fans...I'm guessing they'll find a way to get all that's great about Fringe into it. We'll see! I'm going to guess that the Observers had better tech to remove the "observer tech" from September. There were also comments like he was experimented on and biologically reversed or something like that. So, they "turned him into" a human. It may have been more complex than just pulling that tech out. Good point on the Fringe team moving around so easily. I've seen that Family Guy spoof as well. God times! And you're totally right with the reboot. 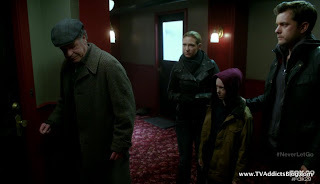 September's observations of Walter/Walternate being a father are what started the whole chain of events (and now we know why he was so fixated on Walter's fatherly ways). So then Peter would technically never meet Olivia. And then what would be the point of changing the universe to eliminate Henry and get Henrietta if they were only going to erase it all in the end? I listened to The Fringe Podcast yesterday, and they spoke about how a consistent theme in the show is "Love Will Find a Way".....so maybe if there was a reboot, somehow Peter and Olivia would still cross paths. 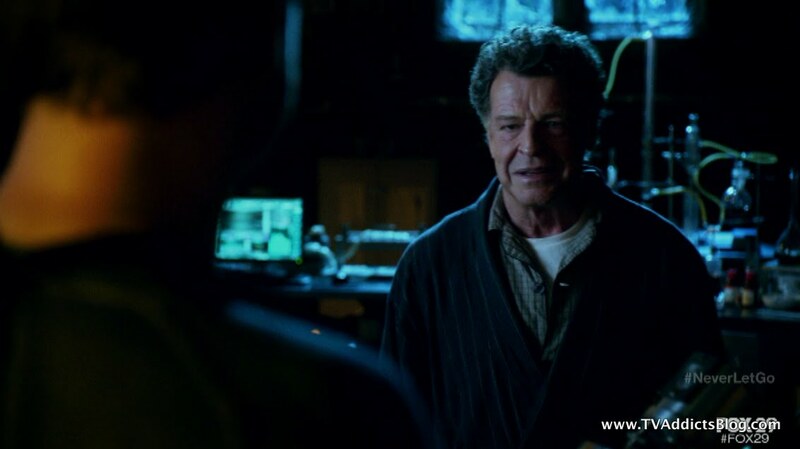 JJ Abrams did an interview (I need to find it) at the finale party where he said that Wyman found a way to tie things back to the older episodes of fringe to make the finale feel inevitable. John Noble says that the finale ends exactly as he always hoped (well, he was talking more for his character than anything). He also could have been referring to Walter becoming whole again finally which was a series long struggle. I agree that any sort of reboot would kind of lead to unanswered questions about what still remains true. It makes me think that they won't go down the reboot path. And I think Michael stepping off that train is a sign of that. Something else is afoot. We'll see in a few days. Can't wait! Go Niners and Go FLYERS!!!!! I was a huge Joe Montana fan and therefore WAS a 49'ers fan for those years. 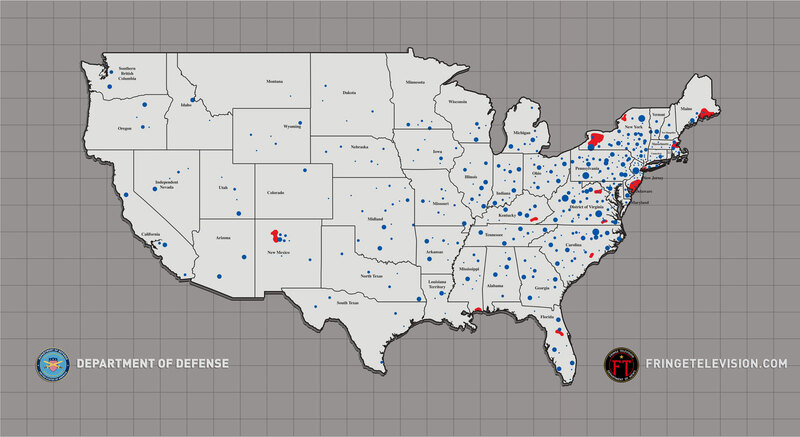 At the time Baltimore didn't have a team, the Colts had moved to Indy. So I had to pick a team and Joe was the man. Still the best QB ever IMO. As for hockey and the Capitals, I am boycotting this year out of disgust at this whole lockout. Perhaps I will watch the playoffs when they start (probably won't end until sometime around the 4th of July..LOL). 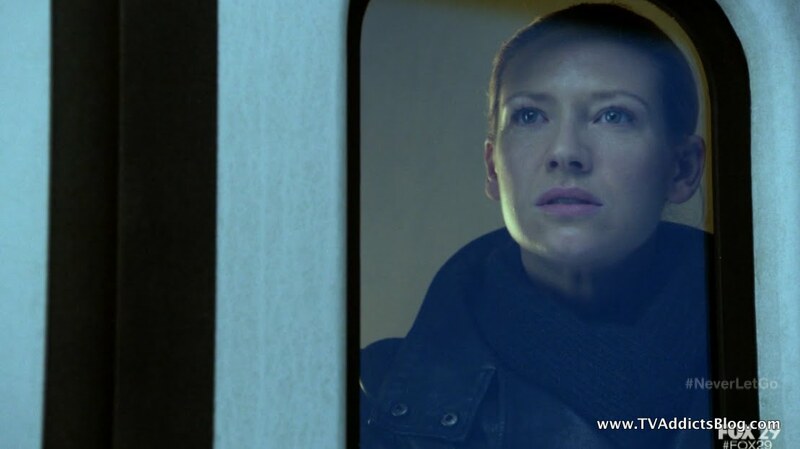 As for Season 4 episode 9, go back and check out the beginning scenes (it all happened prior to the Fringe opening credits). It sure looked like the Observers were in a night-club setting. In fact, one of them tried to "pick up" a waitress and the club manager objected. That got him into an encounter with Widmark. Anyway, like I said, I will be OK with almost any ending because stories involving time travel and parallel universes can never be cleaned up from all paradoxes. Haven't read all posts but it occurs to me - we now know that the Observers are us without any emotions and with bigger brains. So why then do they need so much carbon monoxide? Why is that better for them now ? First off, I think it's carbon DIoxide not MONoxide. I don't think they need it because of their bigger brains or changes in physiology, I think they need it because their bodies have naturally adapted to it. Remember their world is unihabitable (well it was supposed to be but obviously we found out last week that they are still in 2609). As they wrecked the environment and carbon dioxide levels increased their bodies adapted. 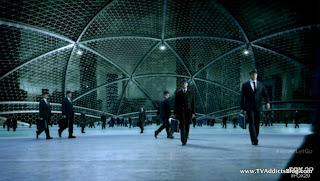 Now, in order to perform optimally, they need to do the same to our environment. You would think this would lead to the same dilemna and create a never ending loop where the observers go back to 2036, wreck the environment over 600 years, then are forced to go back in time again. Oooh, better stop thinking about that one, it's too messy. Bill - LOL on the messy, and the common sense. I debated was is MON or DI - took a 50/50 guess. I see what you are saying though - they ruined our world in the future but are used to it so are making our current time like their future. Thanks. Yes - NFL game were fab this weekend - except pats game. I'll be routing for your Ravens this weekend. As for SFO - on the fence who I"m routing for now. LOL SOrry Mike ! Jensen's been saying all along that colelcting all these things was just part of the journey and not important - guess we know that was wrong now. LOL on the Death Star ! And agreee that they will still surprise us somehow. Thinking I want to make a small party around the Fringe Finale - did it for Lost too. So what to serve besides licorice ?? Don't have much time to comment on everything else right now..but MJ, check back on all of our recaps here and look at the "Food of the Week" under Observ'er'ations. I'm sure Walter concocted some that might be edible. lol I do recall the time he wanted a Strawberry milkshake or ice cream. lol Rhubarb pie, as Bill mentioned also a good one. There's tons!! You could have burgers in honor of Gene (RIP??? lol) good times! That scene is why I have been wondering why there are no Observer women and last week's episode didn't really explain that. In fact what we learned contradicted that scene. 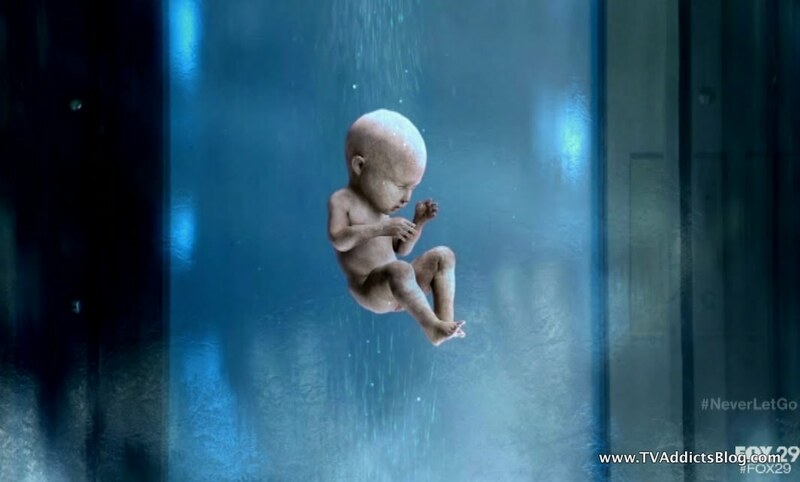 Since they "manufacture" offspring they certainly can control the gender. So, if they still have those urges and they allow them to be manifested (as was implied in S4E19) then why no women? LOL on the burgers ! good one. Part 2 of tv guide farwell to Fringe - has the trailer as well. I already want to cry. LOL... I wasn't really going below the waist either, TMI...LOL. I just was making the case that we were misled in S4E19 given what we learned last week or at least an error in continuity. Final Oral History interview with the cast/crew. I think there are links to the other 3 in there too. Took me all night 2 nights ago to read the previous 3! lol They're really good though. I've been loving the oral histories - haven't read todays yet though. That's a really interesting quote. I'm not sure what to make of it! lol But, I'm super psyched for tonight! Twizzlers sounds like a good idea. lol Enjoy! The Oral History was a great read. Thanks for posting the link Mike. 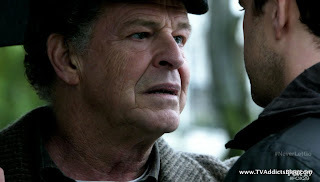 It is apparent that there was something special about every aspect of Fringe - writers, actors, network and fans. I think next week I will email Fox and thank them for allowing the show to reach a proper ending. I am really looking forward to tonight's final episodes. After reading the Oral History at least I know that if I am not happy with the ending it isn't for a lack of effort by all involved with the show. Kind of exciting, fun and sad all rolled into one. Oh well, nothing lasts forever and all good things must pass. I've always been impressed with how "into the show" the cast was. I remember at comic-con one year the 3 main cast members (Josh, John, Anna) getting into some pretty deep discussions about the show in interviews. Throw on top of it how great FOX has been to the show (outside of moving it to Thursdays that one time) and all the TLC that went into making the show....it's pretty awesome. An email to fox sounds like a good idea! From everything I'm hearing about the finale, I'm pretty sure I'm going to enjoy how things end. But we'll see!! And well said with your final comments! Yes, I read all four parts. I copied them into a Word document and printed them out. Much easier and quicker to read on printed paper (or maybe I am showing my age). EW's Top 19 (funny! lol) Fringe Episodes. Whew - finally finished part 4 today ! I was tearing up just reading it. Funny - I didn't get it all read at work due to being busy to I printed it and took it home to read. And - I do the same thing with all the EW recaps and such - paste them into email so I'm not on the net all day at work. I'm looking forward to the show tonight and dreading it at the same time. I always get nervous when they bring up the Sopranos ending and liked it - but I have faith. Really liking all the love everyone is giving the show on line with so many sites doing something to notate the end of Fringe. Also like that they are not going 'radio dark'. Parker is just getting put to bed now, so we'll be starting a little late to be finished when it finishes live...but that's okay! I'm looking forward to it too! Of course, in hindsight, I thought the Sopranos ending was a good time. At the time that it aired, I was annoyed. lol But, I think people just respect Chase for doing that....I don't think they plan on ending Fringe in some crazy way because of it. Same with when Damon and Carlton said they enjoyed the finale. They promised they wouldn't end LOST that way. Very glad Wyman won't go radio dark. I'm sure there won't be much of a reason to when all is said and done. But we'll see! Enjoy the show everyone...whenever you watch!